The second edition of this essential reference updates and combines two earlier titles to capture the many technological advances for predicting the "footprint" of a vapor cloud release. Cited by EPA in its 1996 document, "Off–Site Consequence Analysis Guidance," the aim of the book is to encourage and facilitate the development and use of dispersion modeling as an everyday tool, providing practical understanding of basic physical and chemical principles, guidance in selecting release scenarios and the best available models, and information and examples on how to run some models and interpret outputs. Equally useful to beginners and experts, it compares 22 programs based on input from model developers, and presents 7 examples of typical accidental release scenarios. The book comes with a disk providing input and output data for scenarios. 2. Overview of Modeling Procedures, Including Rationale for Selecting Scenarios for Worked Examples. 2.1 Types of Scenarios and Models. 2.3 Scenarios Selected for Worked Examples. 3.3 Meteorological Data and Formulas for Calculating Input Parameters. 4.1 Conceptual Process for Source Term Determination. 4.2 Calculation of Source Terms. 4.3 Uncertainties in Source Term Estimation. 5.1 Critical Richardson Number Criterion. 5.2 Jet Trajectory and Entrainment. 5.2.2 Elevated Dense Gas Jets. 5.3 Dense Gas Release at grade. 5.3.2 Dense Gas Clouds in the Absence of Heat Exchange. 5.3.3 Dense Gas Clouds in the Presence of Heat Exchanges. 5.4 Transport and Dispersion of Neutrally Buoyant of Passive Gas Clouds. 5.5 Simple Nomograms for Calculating the Dilution of Dense Gas Release. 5.6 Three–Dimensional Numerical Models of Dense Gas Dispersion. 5.7 Transport and Dispersion Near Buildings. 5.7.1 Plume Confinement by Canyons. 5.7.2 Concentrations on Building Faces Due to Releases from Vents. 5.7.3 Concentrations on the Building Downwind Face (the Near–Wake) Due to Releases from Sources on the Building. 5.7.4 Other Effects of Buildings. 5.8 Worst Case Meteorological Conditions. 5.9 Removal by Dry and Wet Deposition. 5.9.1 Gravitational Settling of Large Particles of Aerosols. 5.9.2 Dry Deposition of Small particles and Gases. 5.9.3 Removal of Particles and Gases by Participation and Clouds (Wet Deposition). 6. Averaging Times, Concentration Fluctuations, and Modeling Uncertainties. 6.1 Overview of Physical Considerations Related to Averaging Time. 6.2 Overview of Characteristics of Concentration Fluctuations in Plumes. 6.3 Predictions of Concentrations on the Plume Centerline at a Given Downwind Distance as a Function of Averaging Time, Ta. 6.4 Predictions of Concentrations at a Given Receptor Position as a Function of Averaging Time, Ta. 6.6 A general Structure for the Analysis of Model Uncertainties. 7. Overview of Operational Vapor Cloud Models in Common Use. 7.1 Summary of Commonly used Models. 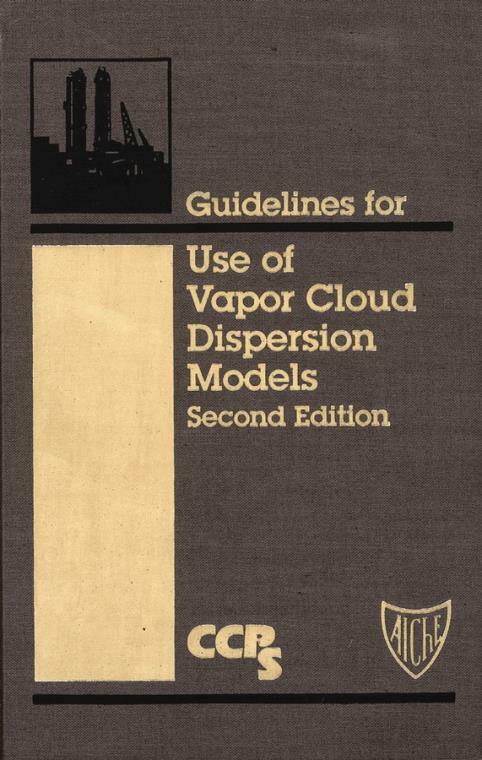 7.2 Characteristics of Commonly Used Vapor Cloud Dispersion Models. 8. Evaluation of Models with Field Data. 8.1 Description of Field Data Sets. 8.4 Results of Model Evaluations. 9. Summary of Seven Worked Examples. 9.1 Description of Seven Scenarios Used for Worked Examples. 9.2 Overview of Predicted Concentrations. Appendix A. Scenario 1: Release of Pressurized Liquid Chlorine. Appendix B. Scenario 2: Liquid (Cryogenic) Spill of Refrigerated Chlorine. Appendix C. Scenario 3: Liquid (Noncryogenic) Spill of Liquid Acetone. Appendix D. Scenario 4: Vertical Jet Release of a Dense Gas (Normal Butane). Appendix E. Scenario 5: Release of SO3 within a Building and Subsequent Dispersion of H2SO4 from a Vent on the Building. Appendix F. Scenario 6: Pressurized Horizontal Gas Jet Release of a Multicomponent Mixture. Appendix G. Scenario 7: Transient (Mitigated) Area–Source Release of Hydrogen Fluoride.